Organic grains. The hops, barley and wheat used in HOUBLONDE are grown without using chemical fertilisers, pesticides or herbicides and without using any genetically modified organisms. Where’s the proof? Look at the label! HOUBLONDE has been granted its European BIO label as well as certification from the Certisys inspection body..
Did you know? The grains contain the nutrients of beer. And even more so if the grains are organic! Fresh, living yeast. 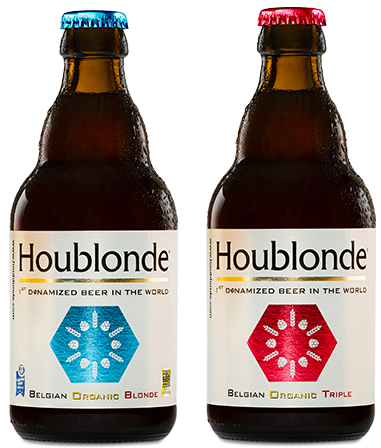 Yeast is what prolongs the re-fermentation process in the bottle, making HOUBLONDE a genuine living beer. «I have tasted a great many lagers in my life. But this one gives me a unique taste sensation. I’d recognise it with my eyes closed.» – Philip, 36.